Recently, there has been an interior design shift toward a more casual, relaxed, bedroom décor. Perhaps because we need a place to unplug, unwind, and disconnect from the busyness of our lives, our bedrooms are becoming that much-needed retreat when we can’t get away to the spa. Relax into one of these heavenly havens. 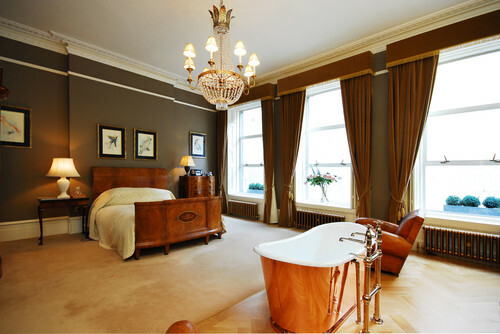 A bedroom with a bath. This spacious bedroom is like having your own private spa, complete with personal soaking tub. The room is full of natural light, airy, and a calm place to escape from the outside world for a while. Warm, earth-toned walls and drapery help the wide open space feel cozy and romantic. And the rose gold tub is a nod to the Art Deco design trend that has also been popular this year. Simplicity and serenity are two of the words that come to mind when you walk into this bright space. The biggest saturation of colors come from the nearby tropical plants on the walk-out patio and the wood frame of the four-poster bed. 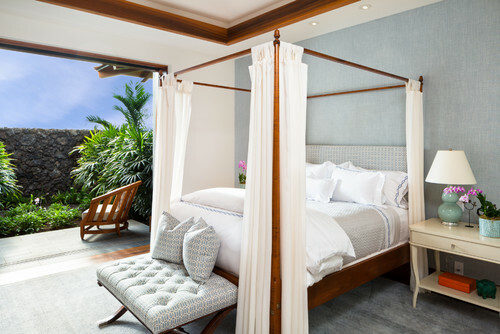 You can just imagine the feel of the ocean breeze as the bed curtains gently billow around you. The neutral colors of the textiles are calming and harmonious. If you had a room with this view, you wouldn’t do anything to distract from it either. 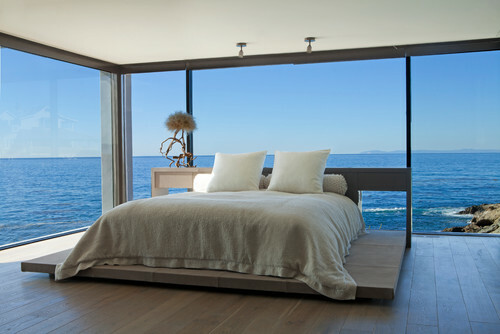 The casual, understated décor in this lovely bedroom does an excellent job of directing your focus out into the ocean. Imagine reconnecting with nature after a busy day and hearing only the sound of the waves to lull you into a restful night’s sleep. Coming home to a bedroom like this every day makes leaving for work just a little easier. Reading by the fire isn’t something reserved only for the living room or study. This cozy bedroom comes complete with its own fireplace for chilly evenings. Like most spa-inspired bedroom decor, the color palette is neutral. The muted blue-grey color of the duvet is reflected in the wing-back chair by the fireplace, the pillows, and the geometric patterns on the roman shades. Geometric patterns continue to be a popular design trend in every room of the house and they work well here as subtle accents to draw the eye upward. Warm, rustic, and relaxing elements abound in this inviting master suite. The dark, natural wood floors and bed frame make the room feel grounded while the white, open ceiling drifts upward so it feels spacious. 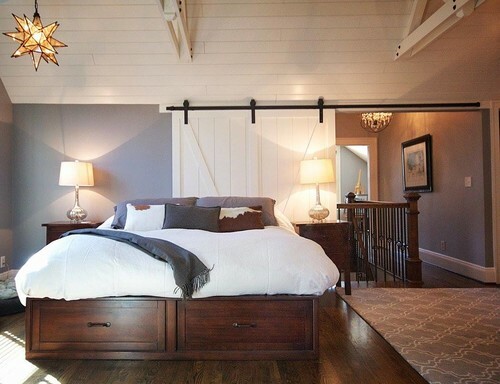 The starlight fixture suspended overhead adds an element of whimsy, and makes perfect sense, as does the white barn doors hanging from wrought iron hardware. Two contemporary elements – the warm grey walls and the geometric rug – bring this old farmhouse style into the twenty-first century. Rustic is always en vogue for its down-to-earth qualities and mixes well with up-to-date accents. If you need more design inspiration to create your own at-home retreat, give us a call at 866-752-7336, send us an email, or schedule an appointment to come in and talk to our talented design consultants. Newer PostTime for a Redesign: Does Your Hotel Lobby Make a Memorable First Impression?